Adaptive headlamps are those headlamps which are capable of turning their beam along the curvature of road thereby improving the visibility at night and increasing the road safety. They are also known as Adaptive Front-lighting System (AFS). Why are the Adaptive headlamps necessary? Frequently, while driving at night, the driver does not feel confident on winding roads due to the blind spot created by the ordinary headlamps. 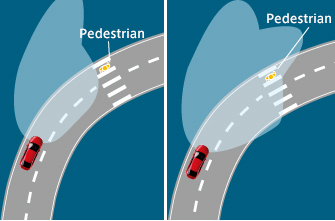 As shown in the diagram below, ordinary headlamps illuminate the area straight ahead of them which is of course not the road in case of a turn. Hence, it creates a major blind spot and the driver cannot see what is on the road ahead. As a result, one has to slow down till the headlamps illuminate the road properly. Also, the straight beam of the ordinary headlamps dazzles the oncoming traffic unnecessarily. To overcome these drawbacks, engineers invented the Adaptive Headlamps. Adaptive headlamps function with the help of sensors which sense the speed of the car, the steering angle and the yaw motion (the motion along the vertical axis of the car). Based on the information collected, they predict the curvature of the road ahead. These sensors then send the signals to the electric motors fitted in the headlamp housing to turn the headlamp beam in the direction of the road and as a result, the formation of a blind spot is avoided. Thus even on the turn, the driver is able to see the road ahead clearly. A typical Adaptive Head-lamps can rotate up to 15° to both the sides from the central position. Manufacturers program Adaptive headlamps in such a way that they function only when the vehicle is moving in the forward direction. 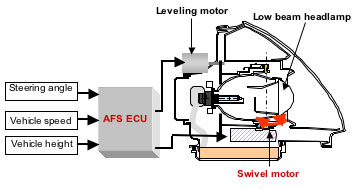 The system de-activates itself if the reverse gear is engaged. Home » Technical Anatomy » What Are Adaptive Headlamps And How Effective They Are? What is APDV by Hero MotoCorps and how it works?